Manchester City striker Sergio Aguero feels the strongest he has in years following successful knee surgery at the end of last season. The Argentina international had an operation on a troublesome issue in April and missed his side's final six Premier League matches of 2017-18. The 30-year-old has started this term in encouraging form, though, scoring twice in the Community Shield win over Chelsea before netting a hat-trick in the 6-1 thrashing of Huddersfield Town. 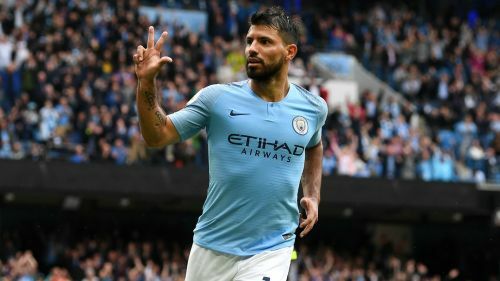 Although he has failed to score in City's three other league games to date, Aguero is feeling the benefit of playing pain-free for the first time in years. "Honestly, I feel fantastic," he said, as quoted by City's official website. "Dr Cugat did amazing work with my knee and now I don't feel any sort of discomfort. "I'm not sure if this is the best start of a season for me, but it's the best I've felt in years. It shows in my game. The challenge now is keeping up this level, and I'll be working non-stop to maintain it." City resume domestic action on Saturday, when they host last season's Championship play-off final winners Fulham. Pep Guardiola's side were held to a 1-1 draw at Wolves last month and Aguero is keen not to underestimate another of the promoted teams. "They have a long-standing tradition in England of being a good footballing team and now they've won a place back in the Premier League," he said. "It's no secret this is one of the most competitive tournaments in the world, played at the highest of levels, so it doesn't matter if they are fresh from promotion or not – they've earned their place here." Is it time we started considering Sergio Aguero among the best Premier League players of all time?